A New Map of the Brittish Isles Shewing their Present Genl. Divisions, Cities and such other Towns, or Places, as answer to the Towns of note, in the time of the Romans. 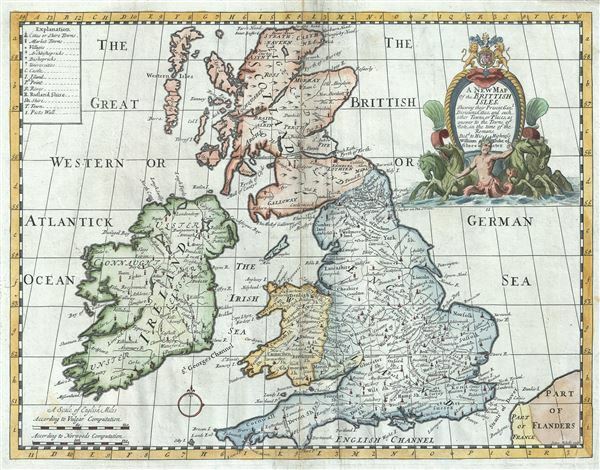 This is a beautiful 1712 map of the British Isles by Edward Wells of Oxford. It covers all of England, Wales, Scotland and Ireland. Highly detailed, it notes the present (1712) general division, cities, towns and places as answer to the towns of note in the time of the Romans. Rivers, roads and other topographical features are also noted. The Wall of Antonine in modern day Scotland and the Wall of Hadrian, fortifications built by the Roman Empire to defend against the unruly tribes of the north, are noted, but not identified. A decorative cartouche appears on the top right quadrant of the map featuring the coat of arms of the Duke of Gloucester. This, like many other Wells maps, is dedicated to Prince William, Duke of Gloucester and son of Queen Anne, who, when this map was being prepared, was a student at Oxford. Engraved by Sutton Nicholls and published by T. Bonwicke for the 1712 edition of Edward Wells' Atlas, A New Sett of Maps both of Ancient and Present Geography. Boston Public Library, Leventhal Map Center, G5740 1719.2 .W45.